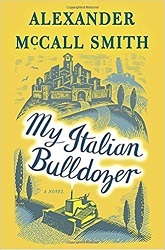 I love Alexander McCall Smith's books! This one has that same gentle philosophy, but I appreciated that, most of the time, the characters did not sound like Mma Ramotswe and Mma Makutsi talking with each other. They were their own distinct people. Though this new main character also takes life as it happens. It was the first time Paul had made duck à l'orange for friends since Becky left him for her personal trainer. Her departure -- after four years of living together -- had been a surprise, but not as great a shock as the discovery of her new lover's identity. Looking back on it, Paul realized that all the signs had been there, and might so easily have been spotted. He felt a lingering, slightly reproachful regret: had he been less absorbed by his work, he might have noticed her indifference; had he given her more time, he might have been forewarned by her restlessness, by the occasional guilty, almost furtive look; but even had he picked this up, nothing could have prepared him for her choice of Tommy, the tattooed mesomorph with whom she suddenly went off to live. "I didn't want this," he said to Gloria, his editor, trying as hard as he could to be stoical. "But it's happened. That's all there is to it, I suppose. People split up." His editor, Gloria, helps Paul make a plan to write his next book about the food of Tuscany - so of course he needs to make a trip there. But when Paul arrives in Tuscany, there's a problem with his rental car - a problem that puts him in jail temporarily. If he hadn't met a helpful Italian on the airplane, things might have gone very badly. But then that new Italian friend puts him in touch with a friend who rents out construction equipment - and Paul ends up renting a bulldozer to drive from Pisa to the hill town of Montalcino. The bulldozer's slow pace meant that a line of cars would build up behind it, but Paul, being able to see very clearly what was coming, could wave people past when it was safe for them to overtake. They signaled their appreciation by sounding their horns, pleased at the courtesy of this construction worker, bound, they assumed, for some pressing local task of earthmoving but still considerate of those with longer distances to cover. A police car went past, slowed down momentarily, but then sped off again. Nobody imagined that the bulldozer was on such a lengthy and inappropriate journey. One thing quickly became clear to Paul. As a regular visitor to Italy he had experience of Italian driving. The Italians are not noted for their patience on the road and will make their displeasure known to any driver who holds them up by sticking to the speed limit. For the visitor, this can be alarming, as small and underpowered cars sweep past them at dangerous corners or on blind rises. But Paul noticed none of this now, and realized that the attitude of other drivers to a bulldozer was one of cautious respect. There was no point in driving too close to its rear in an attempt to get it to speed up; not only would the driver of the bulldozer not see you, but should he brake suddenly, he might not even notice the crumpling of metal as your car collided with the hardened steel outer provinces of his vehicle. In the pecking order of the Italian road, then, a bulldozer's position was evidently not to be questioned. Now, that's not all there is to Paul's adventures. While out driving with the bulldozer, he meets an attractive American woman whose car has gone off the road, and he is able to help. But then Becky wants to talk to him, and comes to Montalcino to do it. And Gloria comes to help him straighten that out. And meanwhile a few uses pop up for the bulldozer that he hadn't anticipated. As with Alexander McCall Smith's other books, this one left me with a smile on my face. Delightful reading.